Wildflower 2018, on and in. I raced Wildflower longcourse back in 2003. I had originally started training for my first sprint triathlon after meeting Peggy who was in training for Wildflower back in 1999. Wildflower was everything Peggy promised. Except in 2003 we had torrential rain, hail and I broke a spoke less than 15-miles into the bike, and rode the rest of the course with a buckled wheel and no front brake. When it came to the run, we had to go up "Beach Hill", a steep 1-mile (1.6 km) climb twice, as the Mountain Bike Triathlon had torn up the run course, overall I had a torrid race for my first "long distance" triathlon, finishing in 7-hours, 22-minutes. 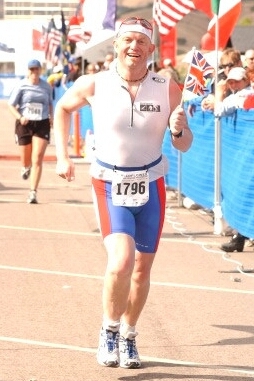 And yeah, I had no idea what I was thinking wearing this race gear, I was just pleased to finish. 2017 has been a totally wash as far as racing goes. I've been unable to swim since late May due to an ongoing wound that won't heal; bike has been OK, with a good Sierra to the Sea bike tour, but little since; running has been hampered with my overall health conditions. I have a lot to do to equal my 2003 race finish time, post heart attack, but I'm going to give what I have and see how I get on. I'm in.